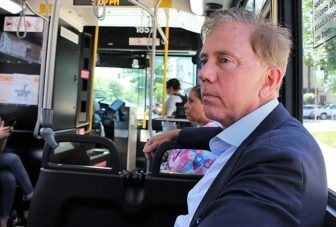 Ned Lamont, endorsed by state Democrats as their candidate for governor, on the bus in New Haven. 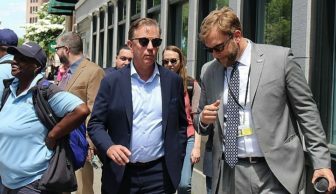 As the 212 bus left Downtown for Grand Avenue in New Haven, Skyler Shepard told Democratic gubernatorial frontrunner Ned Lamont about his recent struggles with homelessness. 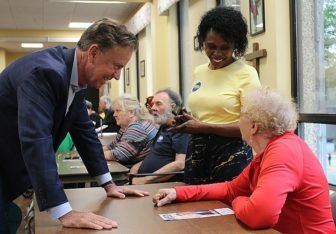 Lamont, a Greenwich businessman who won the state party’s endorsement last month, was on the second day of a campaign visit to New Haven, following up on a Wednesday night visit to the Bella Vista elderly housing complex in Fair Haven Heights. His rounds included a Thursday afternoon public transit and walking tour along Grand Avenue led by city staff. He came to meet everyday voters, hear their stories, crack the occasional flat joke (like one about Kim Jong-un), and try to find a way to connect. Sitting across from him at the back of the bus, Shepard, 20, told Lamont that he had lived on the streets for a year-and-a-half before Youth Continuum, a local social service agency, helped him find a new home just two days ago. Lamont listened. He asked him questions about his family and about his new job at a bar on State Street. “We’re all going to go down to that bar and ask just for you,” Lamont said with a smile, leaving Shepard blushing as he got off the bus near Grand and Blatchley. Skylar Shepard tells Lamont about his new job. The interaction was emblematic of the two-day campaign swing Lamont made, during which he tested his retail-politicking chops by talking with urban, diverse, and poor and working-class constituents, a population that Lamont has said he and the state Democratic Party strives to represent. Lamont was affable, good-natured, quick to tell a joke (some fell flat, some earned a quiet smile), and inquisitive. Committed to niceness and listening to the stories of people with radically different backgrounds from his own, Lamont rarely pitched his own candidacy while talking with voters. He introduced himself as running for governor, but almost never shared a vision for how, if elected, his administration would work to address systemic problems that New Haveners face, such as homelessness, income inequality, rising medical costs and limited job opportunities. “I love this,” Lamont said at the end of his Fair Haven tour on Thursday afternoon. “If you don’t love people, if you don’t love the diversity of New Haven, then you should be a banker or something else” other than governor. Throughout his two days in New Haven, many residents left their conversations with Lamont feeling good about him as a man. Few, however, said they were convinced to vote for him for governor. The retail-politcs contrast between Lamont and his prime challenger for the nomination, Bridgeport Mayor Joe Ganim, was seen most clearly Wednesday night when Lamont visited the Bella Vista senior housing complex. The complex is home to around 3,000 low-income seniors and people with disabilities, many of whom are registered Democrats. Lamont shakes with Howard Saroff. Resident Howard Saroff asked Lamont the exact same question about protecting senior services that he had asked Ganim just two weeks earlier. Afterwards, Saroff said he noticed a difference: He felt Ganim “spoke to me,” while Lamont uttered bromides. Lamont has advantages over Ganim in their competition to become the Democratic candidate for governor. Money is the biggest: Lamont, a Greenwich businessman, is funding his own campaign, and has spent $10 million on previous quests. Ganim has barely broken the half-million mark, and is barred from participating in the state’s public-financing system because of his previous conviction for accepting bribes. Also, Lamont has the party establishment behind him, as he won the state Democratic Party’s endorsement for governor at the party’s nominating convention in Hartford last month. The contrast between Lamont’s visit and Ganim’s shows that he has some catching up to do on the retail politics front, and this primary could test the relative importance of connecting one-on-one with voters versus money and insider support in modern Connecticut primaries. Although the 125 Bella Vista residents who showed up to meet Lamont were largely positive about the candidate, delighting in his smile and warm personality as well as in the free boxes of pizza and bottled water that Lamont’s campaign set up in the common room of Bella Vista’s Building D, some left the meet-and-greet disappointed in a candidate lacking in some of the same human skills and political experience as his opponent. Lamont arrived at Bella Vista just after 5 p.m. A half dozen campaign staff and volunteers, including New Haveners Audrey Tyson (who arranged the visit) and Dave Reyes, passed around Lamont stickers and campaign literature along with free slices of cheese and pepperoni pizza. 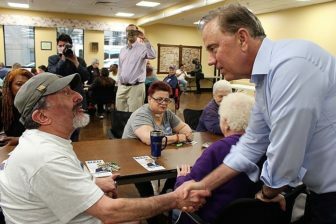 Lamont talks with seniors during his visit to Bella Vista Building D.
Lamont told the crowd that he is not running for governor just on behalf of Connecticut’s elderly population. “I’m also running for your kids and your grandkids,” he said. 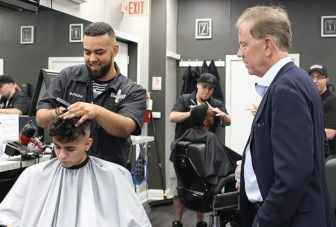 He said he wants to make sure that Connecticut is a place that offers the best opportunities, schools, and jobs to its residents, particularly so that young people decide to stay in this state and start families of their own. For seniors, he said, he is committed to investing in public transit, and is open to the idea of subsidizing free access to pubic transit for the elderly. He said he would also prioritize public safety for senior living complexes like Bella Vista. “Let’s keep this place safe,” he said. As he made the rounds from table to table, Lamont asked residents how they were feeling, how they liked Bella Vista, and whether they supported the Yankees or the Red Sox. He told a few that his mother had been born in Puerto Rico, but largely stuck to exchanging pleasantries with residents and reaffirming his commitment to making a better Connecticut. “I’m going to do everything I can to make sure our kids can stay in this state,” he told Bella Vista resident Maureen Annicelli. “I want to make sure my grandchildren can stay in this state, too,” she replied. As he leaned across one table and introduced himself to a new group, one woman said, “Your beautiful smile tells us everything about you.” Lamont laughed and thanked her. Some residents, like Simon Rosenthal, were encouraged by Lamont’s responses to some of their more policy-oriented questions. Rosenthal wanted to hear Lamont’s thoughts on the national Republican Party’s attacks on Social Security and Medicare, even though he recognized that those are federal and not state programs. Gayle Hall, a Bella Vista resident who said she ran as an independent for city clerk in the 1970s, expressed her frustration with the federal Housing and Urban Development Department’s opening up of senior residential facilities to dependents, family members, and other low-income people of various ages. “Is there ever going to be a place in Connecticut where seniors can say, ‘This is my place?’” Hall asked. Lamont said he had limited control over federal housing policy, but he promised to treat every senior with respect. “Every day is going to get better,” he said, even if his prospective administration would not be able to fix everyone’s problems all on day one. Hall said she was satisfied with Lamont’s response. “He can’t promise what he can’t give,” she said. “But he promised to try.” She said she appreciated the effort he promised to take on behalf of low-income seniors. Some residents, like Saroff, felt that Lamont either avoided their questions or was ill prepared to answer them. Saroff, the chair of the city’s Commission on Aging, asked Lamont about his commitment to protecting state-funded social service programs for seniors. “What will you do as governor to ensure that seniors are not given more cuts?” he asked. Lamont said he planned on increasing state investment in public education and public transportation. Saroff said he was interested in talking specifically about social service programs specific to seniors. In particular, he asked Lamont about the Renters’ Rebate program, which reimburses eligible low-income seniors and people with disabilities up to $900 to help cover rent and utility payments. Saroff said the program had been cut by 7 percent and 10 percent in previous budgets put together by Gov. Dannel P. Malloy’s administration, but that the program was on track to be fully funded this year and next year. Lamont said he was unfamiliar with the program, but that he was committed to greater equity in the budget-making process in general. “We’re currently balancing the budget on the backs of people who can least afford it,” he said. He said the state cannot do that anymore. After the meeting, Saroff told the Independent that he was disappointed that Lamont did not know more about the renters’ rebate program, which he described as critical to many residents at Bella Vista, and to low-income seniors throughout the state. “Any candidate running for governor has to be up-to-date on programs for seniors,” he said. He said Lamont may not be as familiar with it because there may not be many seniors who use the program in the candidate’s home town of Greenwich. He reflected on how Ganim was familiar with the program when Saroff asked him about it two weeks ago. Ganim promised then that he would “restore whatever I can to programs that support seniors,” including the Qualified Medicare Beneficiary coverage provided by the state’s Medicare Savings Program. Bella Vista resident Anita Walters also left disappointed with her interaction with Lamont on the issue of healthcare costs. She told Lamont about her struggles to pay for dental insurance that is separate from her medical insurance and that costs her hundreds of dollars each month. She asked Lamont about any ideas he had for lowering healthcare costs for low-income seniors and people with disabilities. “The most important thing is that we have fair health insurance for everyone,” Lamont said. He said he sympathized with Walters, and that he thought that dental coverage should be included with medical insurance. Walters reiterated her frustrations with the high costs of medical and dental insurance, and asked Lamont about potential political solutions. Lamont reiterated his commitment to fair health insurance for everyone, but didn’t share specifics on how that might be achieved. Walters left the conversation dejected. “He didn’t say anything,” she said. “He avoided the question.” He said Lamont was more interested in talking about education, public safety, the Yankees and the Red Sox than about healthcare for seniors. Neither Saroff nor Walters said they knew who they were going to vote for in the Democratic gubernatorial primary in August. They both said they still had to think through whether they would be supporting Lamont or Ganim. Walters, a registered Democrat, said she is eager to hear Republican candidates’ positions, in case she decides to vote across party lines in the general election in November. After the meet-and-greet, Lamont said he heard at Bella Vista many of the same concerns he’s heard from seniors across the state. He said he heard from Bella Vista residents their concerns about healthcare, public transportation, and public safety. “You’re not going to have the easiest time over the next two, four years,” he said in his pitch to Bella Vista’s residents, “but you’re going to have a governor who respects you every day and knows what it takes” to improve their lives a little bit each day. Lamont speaks with New Haven transit chief Doug Hausladen. On Thursday afternoon, Lamont began the second day of his New Haven tour at City Hall, where he met up with city transit chief Doug Hausladen, Connecticut Transit Division Manager Scott Willis, and a retinue of campaign staff, including Hill Alder Reyes. Lamont and Hausladen walked down Church Street to Chapel, where they waited for the 212 to take them up to Grand Avenue. Hausladen explained his vision for improved public transit infrastructure in New Haven. “Frequency, reliability, and headways,” Hausladen listed off as the three keys for better bus service in New Haven. He said bus-only lanes, converting downtown streets from one-way to two-way, and implementing transit signal priority technology (whereby traffic signals stay green for longer when they recognize that a bus is approaching) would greatly improve the reliability of city buses. Lamont expressed his concern about many off-peak-hour buses being up to 90 percent empty. When Willis told him that the toll box receipts for the bus system in New Haven were around $10 million per year and that the state already subsidizes the cost of each ride by about 80 percent, Lamont bounced around the idea of making bus rides free, at least during off-peak hours. “That would be such a benefit to all workers in New Haven,” Hausladen said. At the bus stop on Chapel between Orange Street and Church Street, bus rider Robert Santiago pulled Hausladen and Lamont aside to talk about a street light that wasn’t working and the inconvenience of not having a bench under the bus stop shelter. When he learned to whom he was talking, he laughed and put his hand to his cheek. He told the city transit chief and the gubernatorial candidate that he was generally quite happy with bus service in New Haven. He and Lamont joked about Santiago’s good luck in his expressing his street light concerns to Hausladen, who can actually do something to get the light fixed. After Lamont had moved on to talk with another commuter waiting for the bus, Santiago said he liked talking with gubernatorial candidate. But, he said, he’s from Bridgeport, and he plans on voting for Ganim. After taking the 212 all the way down to Front Street, Lamont and the group walked across the Grand Avenue bridge to talk with Ben Tortora, the owner of the wine store Grand Vin at the corner of East Grand Avenue and Quinnipiac Avenue. “Joe Ganim sent me,” Lamont joked. “I hear he’s an aficionado of great wines.” That was a reference to cases of wine Ganim accepted as part of a bribery scheme that landed him in jail. Tortora told Lamont about how he grew up at Chapel and Poplar Street, and about how he has owned Grand Vin for 14 years. He recommended a few Spanish wines, Lamont praised his knowledge and taste, and then departed to walk back down Grand Avenue for the next stop. “He seems to be a cordial individual,” Tortora said after Lamont had left. He said he is not sure whom he will be voting for for governor. But, he said, whoever is make sure that small businesses can afford to keep running in cities like New Haven. At Orlando’s Barbershop at Grand and Clinton Ave. The second-to-last stop on the tour was Orlando’s Barbershop at Grand and Clinton Avenue. Lamont walked into the crowded shop, laughed and shook hands with a bald man seated by the register whom he praised as having a great haircut, and then walked through the shop as barbers studiously applied razors to the backs of young men’s heads. “Does anyone ever ask for a Rocket Man haircut?” Lamont joked with one of the barbers, referring to President Donald Trump’s nickname for the peculiarly coiffed dictator of North Korea. The barber looked perplexed. In response to his blank look, Lamont explained the joke. The barber told him no, no one ever asked for a Rocket Man cut. After a final stop at the new Farnam Courts public housing complex, Lamont reflected on his day of riding the bus and walking the street of Fair Haven, and talking with prospective voters along the way. He said he was impressed by the level of pride that New Haveners have for their home city. He said he had fun on the bus, and that he tried to poke and prod city staff a bit about how to make their delivery of services more cost-efficient while maintaining high quality. Lamont also confirmed to the Independent that he will debate Ganim and Democratic gubernatorial candidate Guy Smith if they qualify for the primary. Lamont’s campaign had previously hesitated to confirm that the party-endorsed candidate would debate the Bridgeport Mayor before the primary. Lamont also said that he did not see his continued alliance with lieutenant governor candidate Susan Bysiewicz as anything other than an asset, even though most of New Haven’s political leadership has lined up behind Bysiewicz’s opponent, the 31-year-old labor organizer Eva Bermudez Zimmerman.